Voted 'England's Favourite Village' in 2006 by Country Life magazine. Kingham has two Inns and a number of thriving shops and is a good base from which to explore such places as Stow-in-the-Wold (5 miles), Chipping Norton (4 miles) and the surrounding beautiful Cotswold countryside. In the heart of the Cotswolds, between Chipping Norton and Stow-on-the-Wold, this converted flour mill sits in 40 acres of gardens. It offers free WiFi, car parking, and an on-site restaurant. 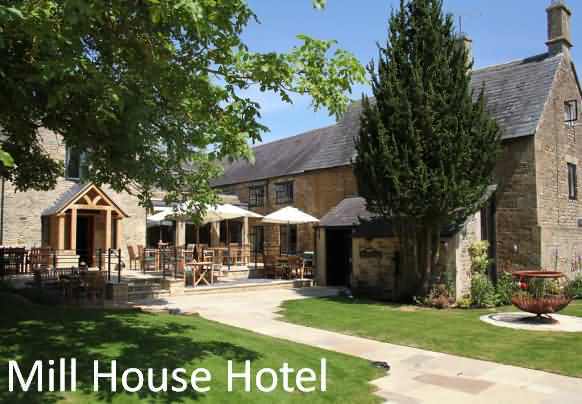 Mill House Hotel is steeped in history, and dates back to the Domesday Book of 1086. Each bedroom is light and spacious, and offers picturesque views of the garden and trout stream. There are three dining options to choose from, with food made from local ingredients. The Mill Brook Restaurant offers à la carte dining, Mill Stream Bar has a 2-course lunch menu, and snacks and cream teas can be enjoyed in the Cotswold Lounge. The Cotswolds is the largest Area of Outstanding Natural Beauty in England. Guests can explore the surrounding villages and market towns, and take a leisurely walk in the picturesque countryside. This property also has one of the best-rated locations in Kingham! Guests are happier about it compared to other properties in the area. The Kingham Plough is a quintessential Cotswold Inn with an outstanding restaurant alongside the perfect village pub. Upstairs, 6 boutique en-suite bedrooms have been created for the maximum of comfort. The seven en-suite bedrooms offer the best in quality and comfort. They provide a simple, tasteful elegance that is reflected throughout The Kingham Plough. Digital plasma televisions, Wi-Fi access, tea, coffee and homemade biscuits compliment these superb rooms. The Sunday Times - Rated Number Five in The Top Ten British Hotels. Since opening in 2007, Chef Proprietor Emily Watkins and her husband Miles Lampson have followed their ethos that provenance is the key to great food and they continue to source only the best local ingredients, both for the kitchen and bar. Their success is reflected in their numerous awards. This year alone, Emily Watkins was winner of BBC’s Great British Menu, and Cotswold Food Hero of the Year in the Cotswold Life Food and Drink Awards and they won Oxfordshire Dining Pub of the Year in the Good Pub Guide 2015 as well as being listed in The Times 25 Best Country Pubs for Food. The Kingham Plough continues to be recommended in the Michelin and AA guides amongst many others. As an Oxfordshire pub with rooms, the Kingham Plough makes it possible to turn your evening meal into the perfect Cotswolds getaway. We have six individually decorated, comfortable en-suite bedrooms, each featuring feather duvets and pillows, Egyptian cotton linen, free WiFi, a large flat screen Smart TV with DVD player, Freeview and iPlayer, Penhaligons ‘Blenheim Bouquet’ toiletries and a mini-bar. Large double/twin rooms with en-suite bathrooms - from £165 per room per night. (Single Occupancy - from £120 per room per night). Standard double/twin rooms with en-suite bathrooms - from£145 per room, per night. (Single Occupancy of these rooms - from £110 per room, per night). Four bedroom Cotswolds cottage in the pictures village of Kingham. This traditional Cotswolds stone property has been enhanced by a contemporary glass extension that floods the ground floor with light and provides ample entertaining space. The new contemporary glass extension with indoor outdoor fireplace. It's a short walk to great local pubs and a lovely walk along a bridal path to Daylesford Organic Farm. Orchard Leigh is found in the village of Kingham near Chipping Norton. 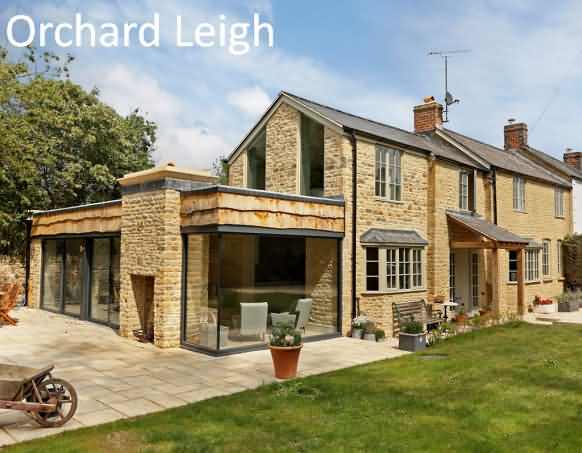 This traditional Cotswolds stone four bedroom property has been enhanced by a contemporary glass extension that floods the ground floor with light and provides ample entertaining space. Being a family home, Orchard Leigh is well equipped to give you a welcoming and trouble free stay. Near to the picture postcard traditional Cotswold village of Kingham. Nestled in a beautiful small bluebell wood in an Area of Outstanding Natural Beauty, the lodges and cottages offer visitors a tranquil escape from the hustle and bustle of modern day living and the perfect base for exploring the many charms the idyllic Cotswolds have to offer. We have a number of lodges and cottages to suit every need, whether you're a couple looking for a romantic short break or family and friends looking for a base to explore the Cotswolds. Lodges and Cottages sleep between 2 and 6 people - see our website for full details.